Plastic Pollution: Where do we Stand? It’s 2019 and at this point, we all know that much of the human impact on our fragile planet comes from pollution. Our landfills are overflowing, and we haven’t successfully dealt with carbon emissions, toxic runoff from farm and lawn fertilizers, pesticides, manufacturing byproducts, mining waste, or the pollutants created by energy generation and transportation. We’re introducing unwanted material to the biosphere at an ever-growing rate and we haven’t yet found the brake pedal, much less put it to use. One of the most depressing topics under this subheading can be summed up in a word: plastic. The issue of environmental plastic is depressing, and in many ways paralyzing, for a simple reason. Each of us personally contributes to the problem every single day, and none of us know how to stop. Here at Just Atonement, we recognize that the problems are of the world are vast. So vast that in some cases, the metrics and charts that detail a given crisis contain numbers incomprehensible to the human mind. How many is a billion? How about 200 billion? How many children go hungry each night in conflict zones? How many people die of cholera each year due to a lack of clean water? How many grains of wheat are required to sustain a population of millions? How many years, months and days must pass before a nation is held accountable for a war crime? These numbers are available, but for most of us, they still somehow lie just out of reach. We can see the charts with our eyes, but we still can’t fully comprehend what they mean. So it goes with plastic and the planet. A single coffee lid or plastic straw will lie on the sand for thousands of years. It will never disappear, generation after generation, lifetime after lifetime. One busy moment at a coffee shop, a single forgotten morning on the way to work, will leave this legacy for millennia. The giant garbage gyres made of such straws and lids are so vast that a two-day drive across a state like Texas still can’t cover their width. Our minds can’t typically process this, and since we need to get to work, the straw goes into the trash, the moment is forgotten and the day goes on. Since we don’t know how to prevent, slow, or comprehend the numerical extremes that lie within this series of events, we don’t want to try. But if we don’t, nobody else will. There is a way around this obstacle. The path is rocky and steep and the outcome is—so far—not guaranteed, but the road has two lanes: personal changes and policy changes. 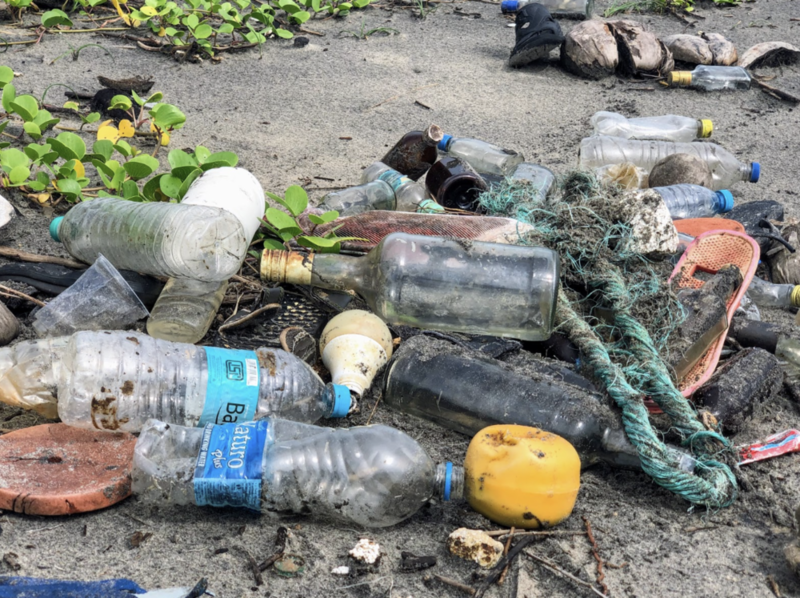 We can work hard to apply cultural pressures that convince our fellow consumers and ourselves to reject single-use plastic even when it’s available and convenient. And we can advocate and vote for policies that will remove plastic options from our lives, making them less available and thereby making individual smart choices easier. But to get to either one, we need something that many of us struggle with: courage. That’s where organizations like Just Atonement can help. To move forward with either path, we need to overcome the paralysis and hopelessness that make us scroll past articles like this one and this one. We need to trust ourselves, have faith, believe that our actions will create real change and then….take those actions. Contemplating a sea turtle choking on our coffee shop straw is NOT pleasant. But contemplate it we must, before we use the straw and—most important-- before we refuse to think about it. Easy? No. But possible? We work every day to keep our eyes fixed on a distant future where sustainability is real, peace is attainable, and humans can live without fear, injustice, or a lack of access to resources, and we believe it IS possible. If you’re looking for ways to gather your courage and help us find a path to that future, please contact our team today! Birth Rates and Population Growth: How Many People can the Planet Support? When we talk about the future of democracy, the future of social institutions, and the future of the environment, we recognize that there are some trend lines that run beneath all three and these trends will have a driving impact one each future individually and on all of them combined. One of these may seem, at a glance, to be the simplest trend line of all: fertility and birthrates. The bottom line on birthrates looks simple at a glance. Measuring the number of literal people in the world is easier than aggregating all the complex metrics that contribute to, say, the global economy. How fast is the population increasing? Is it too fast or not fast enough for sustainability? But of course nothing is as simple as it seems. A rapidly falling birthrate in one country may generate worries about that country’s tax and labor base, but globally, this drop may be offset by a spike in another region that welcomes a burgeoning labor force but worries about resource availability. Are there too many people? Are there not enough people? A yes or no answer simply won’t suffice. The best way to get to the bottom of this puzzle is to gather all the data available—not one trend line, but dozens of them—and draw what conclusions we can by weighing each against the others. In the US, the population has trended precipitously upward in recent decades, but much of the increase has been due to immigration, not birth. In good news for the environment, US birthrates have slowly trended down, but not in all age demographics. And before we can cheer or worry over a specific data point, it’s a good idea to settle on a shared definition of “sustainable” rates. Those who would like to see a robust labor force see gloom in every dip, but those concerned about water resources in southwestern population centers might worry if birthrates inch too high before water and agricultural problems can be solved. And of course, the subject of “correct” family size is both emotional and personal, even as personal decisions, cultural trends, and the reasons behind the trends shift from year to year. For example, some women may choose to have fewer children than they actually want due to economic pressures and concerns about college tuition and childcare costs. But within a year or decade, specific concerns give way to others, and the priorities and life-stage of a potential parent evolve and change over time. Throughout the fertile years of a person’s life, factors that drive birth decisions change as the landscape changes. But as it happens, each person’s decision to have children will have a long-term impact on all of us. That impact is hidden somewhere in a vast field of population data. For more ways to engage with this topic and support our efforts to build a sustainable world, contact the team at Just Atonement. Here in the Just Atonement blog, we’ve spoken at length about the effects of climate change on human migration. As the planet warms, ecosystems are shifting unpredictably and sea levels are rising. As a result, coastal communities are facing enormous economic and lifestyle changes, and those who live further inland are dealing with droughts, storm systems, and water management issues. But there’s one population that will—and has already—felt the first serious impact of changing ecosystems: farmers. Here’s an insightful article from the Guardian that addresses one example of this: the “migrant caravan” that appears to be moving north from central and south America this fall. Those who make a living by growing food and other commercial goods appear to be providing early indicators of the changes that are yet to come for the rest of us. As farm landscapes and water resources shift, these people are among the first to feel the lifestyle and economic effects. And in many cases, these lifestyle changes are already pushing farmers, families and communities onto the road and into new geographic regions. As we’ve discussed in earlier blogs, this will mean massive numbers of people leaving one culture and entering another, with political and social impacts that are so far difficult to measure and predict. How will the new arrivals be treated in their destination areas? Will they find assimilation and acceptance? Will they be easily able to move across political and cultural borders? When the do cross these borders, how will they reestablish themselves in their new lands, and how will they make a living? Over the long term, the question we’ll all need to face is simple (though the factors that influence the answer are terribly complex): Can we navigate waves of human migration crisscrossing the surface of the planet while avoiding wars and political upheaval? Can we manage these changes without attacking each other? When migration takes place, it tends to bring fear, confusion, language and cultural barriers, and skirmishes over what are perceived as limited resources. Who has the right to these resources? Who belongs and who does not? But migration also brings some incredible and positive tendencies, results that are not only essential to our ability to survive and thrive, but in fact have given us most of the things we celebrate about humanity: innovation, new ideas, connection, friendship and family, and the ability to grow and change as the world changes around us. As the planet shifts, will inevitable massive migrations bring out the best or the worst in all of us? We are witnessing the answer as we speak. Contact our team at Just Atonement to learn more. Find out how you can help us move toward our goal of a safer, wiser, more vibrant and sustainable world.